On this page we show you the Stations of the Cross tableaux that are on the walls of Sacred Heart church. You will be able to see them in close-up as you have probably never seen them before. Also, we willÂ describe the scenes depicted at each station. Please note that, if you wish to partake of the Stations as a devotion by contemplating the scenes and praying at each one, we would advise you to make use of other web sites such as THISÂ at Charles Borromeo Catholic Church. 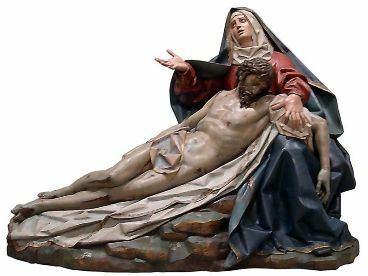 If you are interested in the history and development of the Stations, we recommend The Way of the CrossÂ on the Vatican web site. You can see our own Stations of the Cross by using the menu on the left.